THE DEMOCRATIC UNIONIST Party (DUP) has said that no deal has been reached with Conservative leader Theresa May. 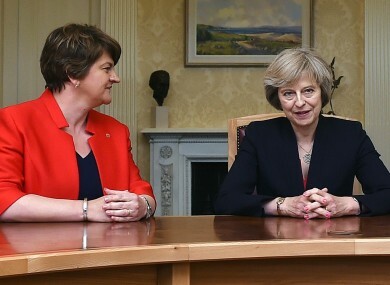 Downing Street last night said that Arlene Foster’s party has agreed to the principles of an outline agreement to support May’s Conservatives in government. A Downing Street spokesperson said last night that the DUP had agreed “to the principles of an outline agreement”. However, a midnight statement from the DUP said that talks on a confidence and supply agreement were ongoing, but had been positive. “The DUP today (Saturday) held discussions with representatives of the Conservative Party in line with Arlene Foster’s commitment to explore how we might bring stability to the nation at this time of great challenge. The talks so far have been positive. May needs the support of the DUP in order to secure a parliamentary majority following her party’s disastrous general election result. Yesterday, her two closest advisors resigned in the wake of this week’s snap election which saw May lose her party’s House of Commons majority. Email “DUP denies it has made a deal with Theresa May”. Feedback on “DUP denies it has made a deal with Theresa May”.